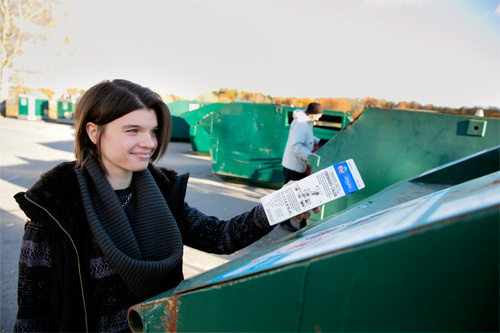 The environment requirements stipulated by EU and the Swedish Parliament have increased, and households are becoming increasingly better with regard to the sorting of refuse. Accordingly, most of the waste that is generated today is recycled and utilised in different ways. The absolutely most important part of today’s handling of waste is that hazardous waste is taken care of. The resulting benefit to the environment is considerable, because the incorrect handling of hazardous waste can have serious consequences. If hazardous waste is deposited in the wrong place it can result in major environmental problems. VafabMiljö receive considerable amounts of hazardous waste from households via the Recycling Centers. We can deal with some of the waste that is classified as hazardous ourselves, eg, oil polluted soil and oil polluted water. Foodwaste are deposited as biomass at the Biogas plant in Västerås where it is converted into biogas for motor vehicles and into biofertilizer. Residual waste, wood and non-rigid plastic, is converted into heat and electric power in environment approved incinerators. Other environment improvements are the saving in energy that recycling creates. When recycled material is used in the manufacturing of various products, less energy is most often consumed compared to using new raw material. This saving in energy means that the emission of various substances that are detrimental to the environment is lower for most recyclable material. urthermore, recycling contributes to saving the earth’s Resources. Eg, food waste, coffee grounds. Is decomposed together with ley crops in the biogas plant, becoming fuel for motor vehicles and a residual digested sludge that is used as fertilizer in the fields. Eg, nappies, dishcloths, discarded toys. Deposited for incineration and energy recovery. Both bio-waste and residual waste in the same bin are deposited for incineration and energy recovery. Is sorted manually. The various grades of waste paper are utilised in the manufacturing of new paper of different grades. Eg, milk cartons. Utilised in the manufacturing of the paper surface on gypsum wallboard, and for new packaging. Eg, spray cans, tin cans. Are machine sorted into different kinds of metal. Steel goes to the smelting plant and is eventually turned into engine parts, reinforcement bars, etc. Aluminium is also recycled. Eg, ketchup bottles. Are sorted manually. Granulated and sold to the recycling industry; for example to become sleighs, fencing, compost bins, pipes, etc. Eg, plastic bags. Deposited for incineration and energy recovery. Eg, glass jars. Becomes new glass, insulation (glass wool) and is mixed in concrete. Eg, planks. Crushed and deposited for incineration and energy recovery. Eg, bicycles. Fragmented and separated in different material for recycling at smelting works. Cut up and composted together with farmyard manure. Becomes useful planting soil, eg, in parks. Forwarded for the manufacturing of new cardboard. Eg, computers. Dismantled and certain parts are recycled. Components that are detrimental to the environment are taken charge of and neutralised. Freon is recovered from the refrigeration circuit, and insulation material is taken charge of and neutralised. Metal and plastic material is recycled. Eg, waste oil, paint. Oil is forwarded for reprocessing into heating oil. Remains of paint and PCB waste, etc, are forwarded for destruction. Is hazardous waste and is forwarded to Fortum Waste Solutions. Eg, wallpapers, leather, rubber tire for bicycle. Deposited for incineration and energy recovery. Eg, gypsum wallboard. Can be recycled into new gypsum wallboard. Eg, fibre-glass insulation, mirror glass. Is deposited on the landfill.